Best church sign ever: "Some people are gay. 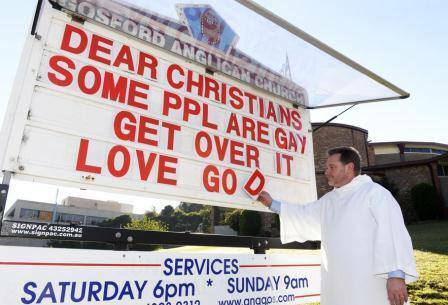 Get over it"
Father Rod Bower is an Anglican priest, outspoken supporter of gay rights and the creative force behind his church's marquee sign. His latest message to parishioners and passersby, "Dear Christians, Some people are gay. Get over it. Love, God," reached far more than the residents of Gosford, Australia, after an image posted to Facebook went viral, receiving more than 100,000 views within a 24-hour period. When asked why he thinks the photo took off, Bower told the Daily Telegraph that people's interest "shows that it's an important issue and that a lot of people have spiritual questions that are not being met by traditional forms of Christianity." As for his pithy approach and choice of subject matter (other messages include, "Dear Christians, I don't have a plan. Scary, isn't it? Love, God"), Bower explained that he is trying to reflect on "what the spirit of God might be saying in a modern world." Other examples of Bower's affirming, hilarious and, at times, delightfully weird sloganeering can be found here.